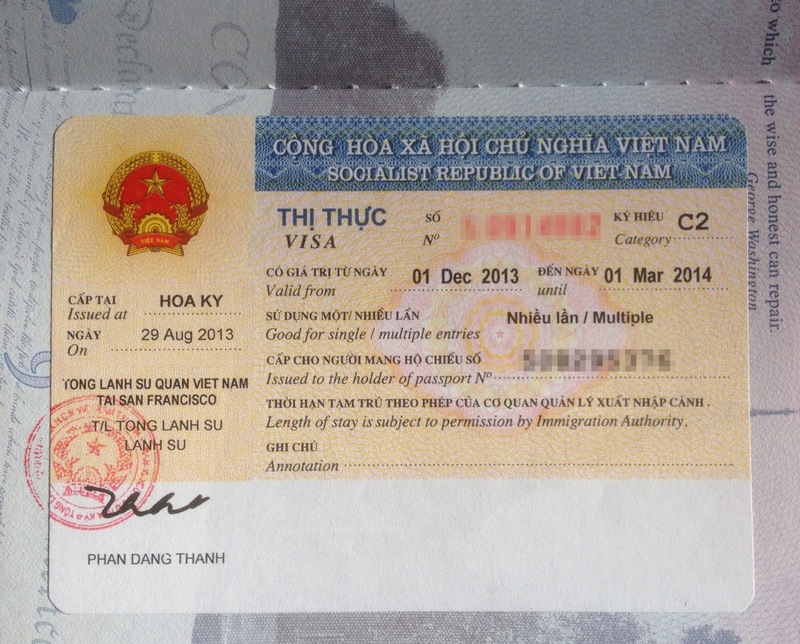 Got my Viet Nam visa! 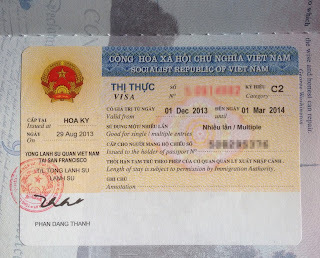 Today, only a week after sending it in, I received my passport back with the three-month, multiple-entry Viet Nam visa. Since you have to have it to get on the plane, I'm stoked! While riding around town over the past weekend--gotta get in as many miles as possible before the rains come--I ran into Eppo at the Westside Co-op. He was taking a break from playing the violin (I thought it was a fiddle) for passersby, so we sat and talked for a while. When the conversation turned to my bike, I told him about my upcoming trip. His first question was, "Are you going alone?" Then he told me about some of his travels in Thailand and how it's nice to occasionally have some company. Are you going to be in Southeast Asia in December or January? If so, drop me a email or leave a comment below if you'd like to see if we can spend a couple of days traveling together or just hanging out. I'll be staying in hostels or B&B's most of the time, eating local food, and meeting the locals. The route is pretty set, the timeframe is flexible. I look forward to hearing your ideas. In case anyone is wondering why I'd publish this on-line for potential thieves to know when to stop by and load up a truck, I have a security system, a house-sitter, and an attack cat--plus a County Sheriff friend who'll be making random checks. Heard from a friend last night after he read my first post. He suggested that I contact two people he knows who have traveled extensively in SE Asia and another who lives there. I'm looking forward to contacting each and learning as much as I can from them. If, while reading this blog, you think of someone who would be good for me to talk/email with or a web site or other resource that would enhance my trip, please post it in the comments. Any contact or personal information will be scrubbed before publishing the comment for the public. Thank you! Tomorrow I'll send in my application for a three-month, multiple-entry Vietnamese visa to the Consulate in San Francisco. There are two applications on-line, one to send to the Embassy in Washington, DC and another for the Consulate. Since I live on the left coast, I'm using the Consulate. Either way, the fee is $180 (it's $150 for one-month, multiple-entry; $100 for one-month, single entry). They also require a 2x2 photo (two if you use the Embassy) and a FedEx or USPS Express Mail return envelope. Processing time is quoted as about 3 days--add shipping time both ways, and I'm hoping to have it back in <10 days. One last detail... an International Driver's License from AAA... only $15 and two passport-size photos--and you don't have to be a AAA member. If you're a Costco member, it's only $5 for four passport photos--by far, the best price around. I bought 20. Last January (2013), I decided to plan a trip to SE Asia. Soon my must-see list included Vietnam, Laos, Cambodia, and Thailand with Burma as a maybe. In February, I decided to do the entire trip via motorcycle--even though in the last 59 years I had only ever ridden about 15 miles on one. I bought very detailed maps of the above countries, signed up for two motorcycle training classes, and bought a 2007 Kawasaki KLR650 and all the requisite gear. The bonus is that I can now add motorcycle training facilitation to the instructional design I've done for many years. In late March, after completing both the on-road and the off-road motorcycle courses and with about 18 miles under my helmet since the training classes, I forgot THE cardinal rule--look where you want to go--and rode right into a ditch, breaking my left clavicle. Both broken and very embarrassed, I somehow managed to get the bike out of the ditch and ride home with the handlebars turned 45 degrees just to go straight. Then I backed the bike into the garage, removed my gloves, helmet, jacket, boots, and riding pants--with a broken clavicle and a big bump where the two pieces were now overlapping. I even got into the car to drive myself to the ER, but when I tried to reach over with my right arm and pull the driver's door closed, I finally realized I was in shock and should call for help. A call to 9-1-1 brought the volunteers of the Griffin Fire Department and an ambulance to my door. Having been a Griffin firefighter years ago, I knew most of them. This meant enduring a bit of good-natured grief, mostly about the deal they might get on my damaged bike and what I was possibly thinking when I decided to learn to ride a "donorcycle." When Deputy Chief John asked why I didn't call from the ditch, I admitted that I was too embarrassed. He suggested that next time I call from the accident site. "Next time"??? Thank goodness for full insurance! The ambulance ride was ~$950 and the total cost for surgery, bike repair, etc. was over $10,000--all incurred before I had even paid my first premium. My only out-of-pocket was the $500 deductible. 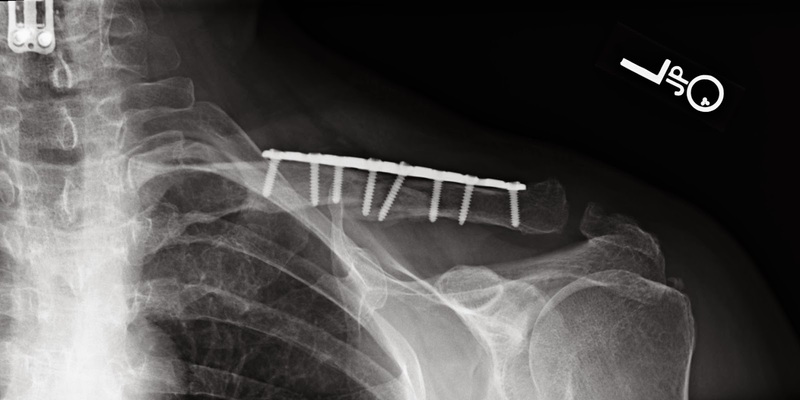 A few days later I had surgery to screw a plate into my clavicle to hold it in place. I promised the doc and my client that I would refrain from riding until the end of May so that it would have time to properly heal and so I could complete the client's project on-time. Yes, I'm still planning the trip and will soon be sending my passport off for the required visas. The currently planned route starts in Saigon (where I'll purchase a bike), Hoi Ann, Hanoi, Ha Long Bay, Sa Pa, various locations in Laos, NW Thailand (Golden Triangle area), Burma (? ), then back through Bangkok to Cambodia (Siem Reap, Angkor Tham, and much more), arriving back to Saigon in time to meet Seattle friend Huong for Tet. This blog will be a way of keeping notes during the trip so that it's easier to write articles for travel and motorcycle magazines--as well as letting friends share the experience. The posts here will be infrequent until much closer to departure, so make a note to come back to visit a bit later this fall.